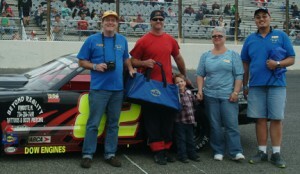 Home » 2012 Minutes » MARFC Day at Flat Rock Speedway! MARFC Day at Flat Rock Speedway! June 2nd took the club over to the Flat Rock Speedway where the driver of the #82 Street Stock, Rob Moore was the recipient of the MARFC Helmet Bag and club member Susan Smith won the member raffle. The club was well represented at the membership table with Jeff Horan, Wild Bill Barnhart, Fran Russo, Tony Russo, Steve and Cory Russell, Rand Thompson, Laura Tucker, and Al Peltier. Previous post MARFC ATTENDS 2012 NAARFC ANNUAL CONVENTION! Next post MARFC HAS A PRESENCE AT THE DETROIT GRAND PRIX!